August 6, 1991. My CD changer rotated between Garth Brooks, C+C Music Factory, and R.E.M. A little band called Nirvana was making its first appearance on MTV. I was about to enter 8th grade in a new school, in a new town. I didn’t own any Z Cavaricci’s, but man, did I want some. And little did I know that, five thousand miles away, a scientist was about to push a button that would set the course for my professional life. From a laboratory in Switzerland (at a little place called CERN, you may have heard of it), Tim Berners-Lee published the simple text-only HTML page on a clunky black NeXT computer with the goal of launching a "hypermedia information retrieval initiative." Although it was only accessed by a small group of fellow researchers until 1993, when browsers became a thing, this first website set the stage for the coming Internet revolution, the first small step that would lead to a giant leap for the entire planet. PshhhkkkkkrrrrkaringchchchchchcchCHIRPCHIRP: This was the sound that would change my life. 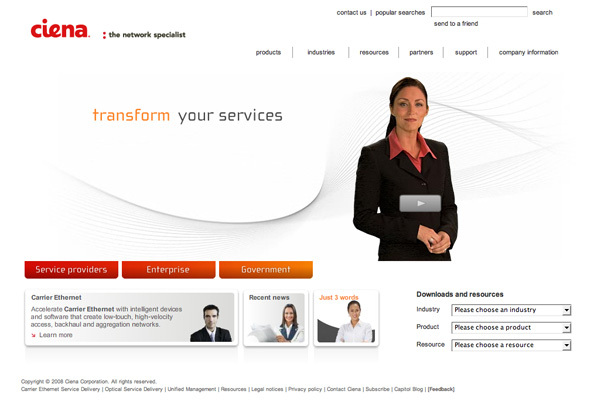 Ciena’s homepage was mostly text and, except for some images along the right (!!! ), it had no standard navigation bar. We liked to scream our name at our visitors. Press releases dominated the page and were the most dynamic type of content on the site. We were a new company, so the description of who we were and what we did was front and center. Ciena only had five products at the time, so our product story was downplayed a bit. A mysterious individual called the ‘webmaster’ (who was possibly sitting in a closet wearing a wizard hat) was referenced at the bottom. This was the era before Google. We didn’t have to worry about pesky things like indexable navigation. If you wanted to show up in search results, you contacted Yahoo or Alta Vista and asked to be added. In the late 90’s we didn’t run banner campaigns. Google and social media didn’t exist, so the website simply provided air cover for offline sales conversations. The main purpose was to reiterate product positioning and digitize all the wonderful glossy brochures and data sheets that were being cranked out by marketing. Product features and functionality changed so rapidly, half of my time was spent updating product literature online. In the early 2000’s, we felt there was an opportunity to educate the market, so we launched Optical University. We developed short video seminars that were light on branding but heavy on useful information. Optical U was mildly successful, but lacked a good amplification strategy because social media still didn’t exist at this time. Video has been around since the earliest days of the web, but it was typically a slow, short, and exotic experience. Outside of news media websites and… other industries, it was not part of the typical web browsing experience. That changed in early 2005 with the launch of YouTube. Suddenly, we had a platform to not only watch, but also upload videos of our own. The Internet was no longer a passive, consumption-geared medium. 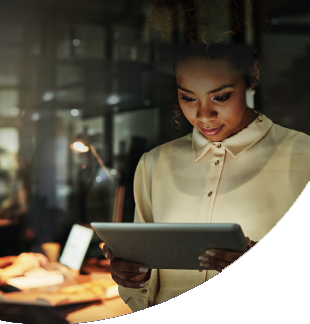 As we had with search marketing, Ciena quickly recognized the transformative power of video and incorporated it into our web strategy, starting with ‘talking head’ videos about our products and solutions. When we launched a redesigned website in early 2008, video was front and center. 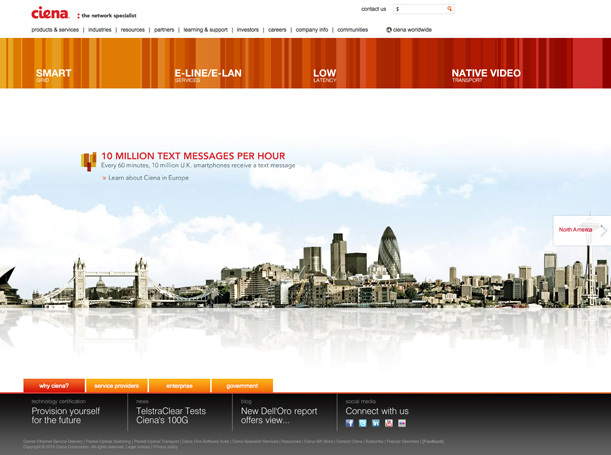 Visitors to the Ciena.com homepage would see video messages welcoming them to the site and providing a short overview of our solutions. Although the slightly animated, occasionally blinking videos were perhaps a bit creepy, they were wildly popular. We blew through our annual video streaming budget in less than a month. 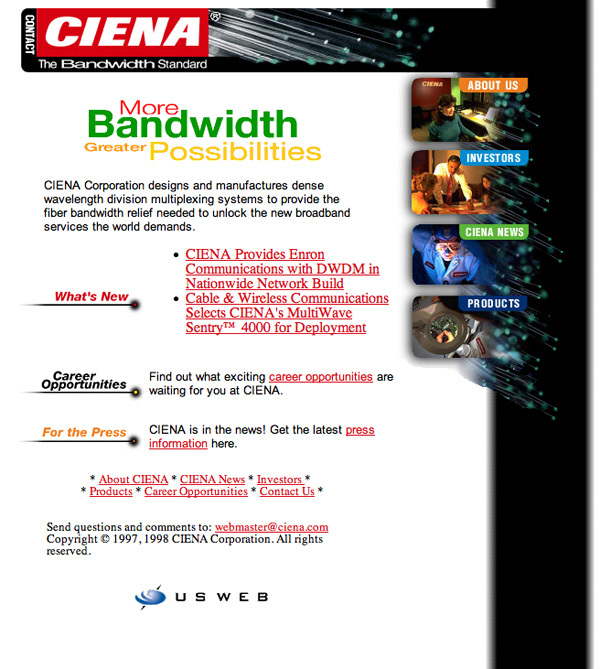 Ciena had entered the video age. 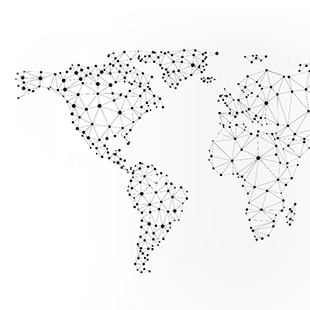 In 2010, Ciena acquired Nortel’s Metro Ethernet Networks division and developed a global footprint overnight. Our branding evolved to acknowledge the importance of our global markets. 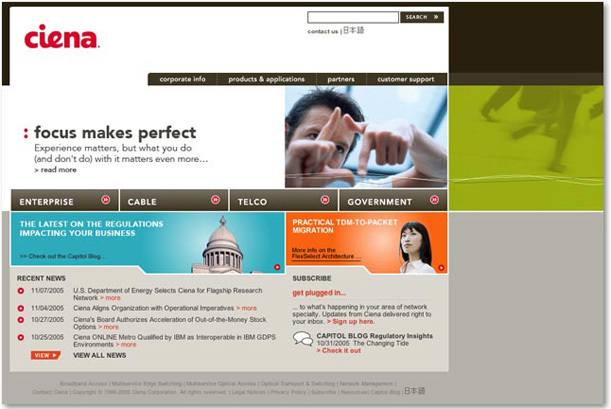 Translated websites reemerged as part of our web portfolio to help introduce Ciena to new regions. The number of items in Ciena.com’s top navigation expanded significantly to reflect our growing product and service portfolio. We launched our social media channels in 2008, and by 2010 they had matured enough to be featured on the homepage, along with our relaunched blog. Video remained an important part of our web strategy, but it took a backseat to our focus on globalization. In 2014, we launched a homepage design that has enjoyed a longer lifespan than any since 2004. 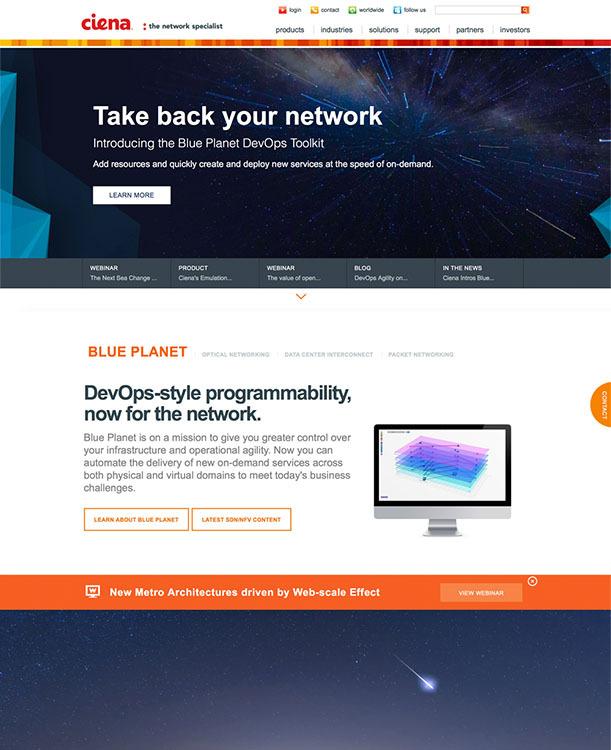 It not only looks cool, with big, beautiful imagery and parallax scrolling, but it incorporates the best practices we’ve learned over the past 20 years. We tell stories and refrain from simply listing the many technical benefits of our products. We target our messaging to our audiences using the information and language that works best for them. While website trends may come and go (have you signed our guestbook? ), one thing remains clear: Behind every successful website is the network to carry it to users—in other words, the bandwidth. According to the HTTP Archive Report, the average website in 2015 had a ‘weight’ of 2,262 KB. Compare that to the very first website 25 years ago, which clocked in—even its enhanced HTML version with hyperlinks—at 4 KB. That’s an increase of 56,000 percent. Today, a single image requires more bandwidth than that entire site. For example, the average image on the Coca-Cola U.S. homepage (23 KB) is equivalent to almost six copies of the first website in size—for that one piece of content alone. What’s next for Ciena.com? We’ll continue to embrace the latest web technology and usability trends. 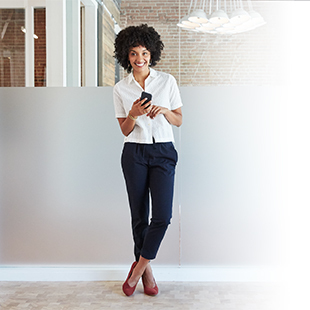 We’ll bring Ciena to our customers wherever they are, on whatever device they are using. We’ll continue to highlight our award-winning technology, but put our people and our customers first. And we can’t wait to show you what’s next.